If you’re a fan of the television show Live from Studio Five you may have seen one of our pet models appear as part of the build up to the World Cup. 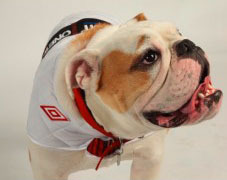 The producers were looking for a British Bulldog to appear on the show, picking out scores for the England vs. USA match. It was Catherine’s well trained pooch Charlie who was selected for the part.